Q. How much did you miss this place last year? RAFAEL NADAL: Well, I missed a lot of places last year. Well, always when you miss a tournament like the US Open, is not a good new. So for me the chance to be back here playing, I have a chance to compete this year, is great. I am enjoying the week before practicing. Today the first match after two years in the Arthur Ashe, so is a great feeling. Q. 15-0 and the two wins coming in on hard court, do you think you're playing the best hard court tennis of your career? RAFAEL NADAL: No. I played well. I just played well, I think. I played a very good level. But I had success in the past when I was playing well, too, on hard. Is difficult to analyze now. I am playing well. I played well better in Cincinnati and Montréal than what I played in the Olympics in 2008? I don't think so. I don't know. Or I played better than when I won here in 2010? I don't know. I was playing well. To win two Masters 1000 in a row against the opponents I had a chance to beat, sure I was playing a very high level. But is very difficult to compare year by year. I just played very well. Happy the way I was playing. I don't know if it was the best or not, but was very good because I was able to win. RAFAEL NADAL: We go day to day. Two tournaments before winning is great for my career because both tournaments are very important ones. But that not means I will play great here. That means that I am doing the right things. This is a different tournament. I hope to be ready for that. Today I started with a good win, an important win. Always the first round is not easy. The conditions out there today were difficult, so happy to be through. Win in straight sets, so is a good start for me. Q. What are your thoughts on what James Blake has meant to men's tennis and to the tour in general? RAFAEL NADAL: Well, James was one of the more charismatic players on tour. His style of game was spectacular a lot of days. He was able to play winners on the return with great first serves, and his forehand was one of the best on tour, no? Without no one doubt, he was able to hit very hard. His image was great. He's a good example for the kids and a good example for the tour. He's a really good person. Q. In recent years some players have tried the gluten free diet. I was wondering if at some point you were interested in that or not at all? 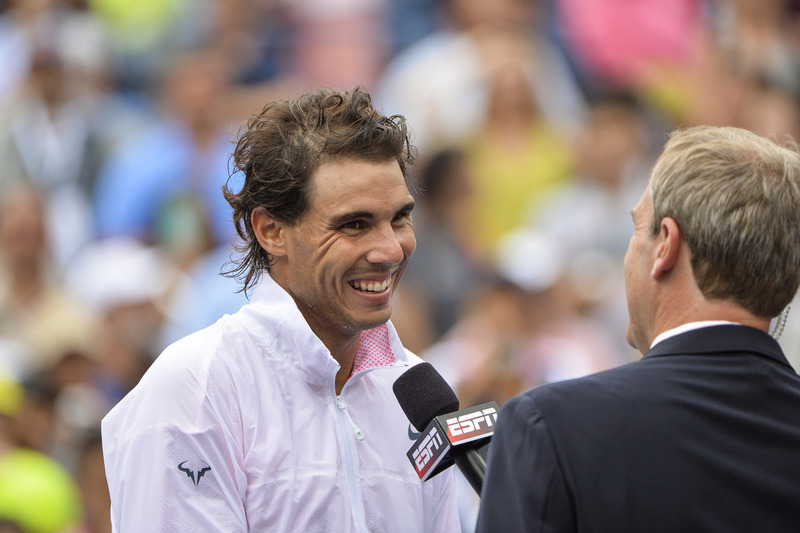 RAFAEL NADAL: You know, at the end of the day, all the small things can help if you don't get crazy. I always had the theory that most important thing is be happy, enjoy what are you doing, and be fresh mentally. If have the gluten free diet or have the perfect diet or these kind of things supposed to you a change or a big sacrifice for you and that produce you not being happy the rest of the day, not being fresh mentally because that's a lot of effort for you, better don't do it. If does nothing for you and you feel that's the right thing to do to be fit, so do it. It's not a secret, and is not only one way to be a good tennis player or to be fit. Not all the players who had success in the history had the same diet or had the same style of play. Everybody's different. Now seems like the gluten free diet is great. After three years or four years we will find another thing that will be great, too. Then the gluten free will not work anymore. So all these kind of things that are news, personally I am not doing. I am happy with the normal diet. But I don't say is negative. I will say everybody's free to do what he wants. Everybody are not working the same things. Q. How do you work to stay happy, and how do you work to be mentally fresh? RAFAEL NADAL: Everything very normal. Nothing strange in my life. I practice. I practice physical performance, practice tennis. I go fishing. I play golf. I go party when I have the chance to go party. That's all. Really normal guy, normal life. So for me that's produce me the real feeling. Doing these kind of things, I feel ready. That's not means that's the correct thing for everybody. It's correct thing for me. Q. American men's tennis, they're looking for the next one. Ryan, what does he have to do to get into the upper class? RAFAEL NADAL: Improve. Is always the same for everybody. For me. Keep improving all the time. If you are able to keep improving all the time, you will have the chance to be in the top. For me today, I am going on court every day with the ball to keep improving. So for him should be the same. If he's able to keep doing better and better, he will have the chance to be in the top positions. He has a good serve. He has good movements on the net. He has good shots from the baseline. So he's able, you know, to keep improving and to be more regular, more stable, play with less unforced errors, so will have his chance. I am sure on that. We'll see what's going on. But he's one of the possible future top players. Q. What aspects of your game were working best for you today and what do you think you need to improve on in the later rounds of the tournament? RAFAEL NADAL: Today the conditions out there were very difficult, in my opinion, because normally this very big court, the winds goes one side. Can be very strong. But today the wind moves a lot around, changing directions all the time. That makes the match very difficult. But for moments I think I played well with my forehand. I was able to go to the net a few times, even if I lost a few times when I go to the net, the point. That's the right thing to do. Even if I lost a few ones at the beginning, I was able to keep doing and having success later. Yes, I didn't have a lot of breakpoints against during the whole match. That's always a positive thing. I think two in one game, 15 40. For the rest of the match I was comfortable with myself. Then I played a little bit more behind the baseline than the previous tournaments. You need to keep adapting a little bit to the courts and to these balls that are different than the previous tournaments. The balls are a little bit slower. But for the rest of the thing, I played a very complete match. I'm happy with the way I am playing.